Available in four colors, as full kit or body only! The upgraded version of the popular Eleaf iStick 20W, this is the same great device - now with more power capable of supporting sub ohm coils! 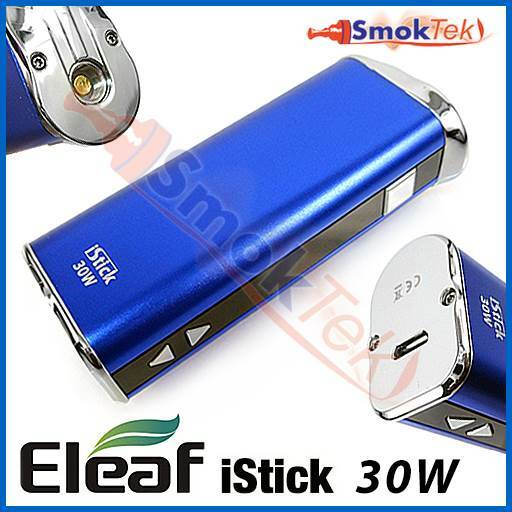 The Eleaf iStick 30W is a compact, easy to use box mod that fits in the palm of your hand. Small, but powerful, the iStick is an excellent option for those of you looking for a discreet, portable device. The iStick's high capacity 2200mAh lithium-ion battery will last a long time between charges. This mod allows you to adjust wattage between 5.0-30.0W and voltage between 2.0-8.0V in 0.1W/V increments, and has an easy to read OLED screen which displays your output power, atomizer resistance and battery life at a glance. This upgraded version of the iStick features a spring-loaded 510 connection and anenlarged top cap - the device can now handle all of your 22mm atomizers, like the Aspire Atlantis, with no over-hang! The iStick is compatible with most 510 atomizers on the market. To use the iStick with eGo-threaded atomizers like the Kanger Mini ProTank-3, you will need an eGo-510 connector (available at a discounted price from the Make-it-a-Kit menu above.) To run 808-threaded atomizers on this device, you will need an 808-510 adapter. Using the iStick is easy. To turn the unit on, press the square firing button 5 times. To switch between Voltage and Wattage mode, click the firing button 3 times. Using the triangular up and down buttons, you can set the device to your preferred volt or watt setting in 0.1V/W increments. Long-press either the up or down button to enter into AUTO mode: pressing either button in this mode will increase the speed of adjusting power by 0.2V/W or 0.5V/W. 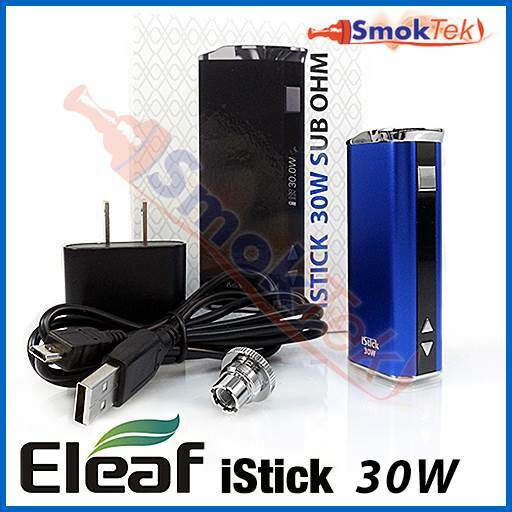 The iStick 30W offers 10-second cutoff, Short Circuit and Low Voltage protection. The mod can also now be Locked to prevent accidental misfires: simply hold the up and down buttons for 2 seconds at the same time to Lock or Unlock the iStick! Choose the Make It a Kit option to get an USB charger, wall adapter and/or an eGo-510 adapter at a discounted price!